The Marine Corps' weight and body fat standards are health and performance-based, and not based on appearance. Marines are considered not within these standards when their body weight and body fat exceed the maximum limits. Each Marine is weighed at least semi-annually (annually for Reserves)​ and is compared to the below chart. When measuring height, the Marine stands with his or her back against a wall, head facing forward and heels flat on the floor. Shoulders are back and arms hang relaxed at the sides. Height rounded to the nearest full inch. Weight is measured on a calibrated scale, either digital or a balance beam scale. Marines are measured in their PT uniforms with no shoes (one pound is taken off the measured weight to account for the PT uniform only). Weight is rounded to the nearest full pound. If a Marine's weight exceeds the regulation weight limits, he or she will be measured for body fat. Marines who exceed the body fat allowance are enrolled in the Body Composition Program—once known as the "Weight Control Program." If the Marine fails to lose the required weight and body fat required to meet standards while enrolled in the Body Composition Program, this may result in an involuntary discharge. 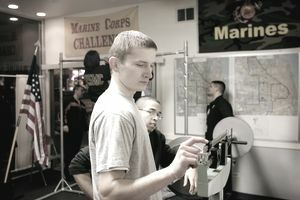 Marines who are over the weight on the chart but meet the body fat standard are considered to be within the required standards, and no further action is taken. The following charts are updated as of 2017. Note: No action is required for Marines who are below the minimum standards. Commanders may refer such Marines for a medical evaluation to determine if they are in good health. Male Marines are not to exceed 18 percent body, and female Marines may not exceed 26 percent body fat. These figures apply to entry-level Marine recruits and extend through their first few years of service. As of 2017, Marines may have their body fat composition disregarded if they master the physical fitness test (PFT) and the combat fitness test (CFT). The requirements are extremely challenging, however: A score of 285 or higher is required on both tests to be totally exempt from the body fat limits. While on the Body Composition program, if a Marine fails to lose the required weight/body fat to get within standards, he can ultimately be discharged from the United States Marine Corps.